Go Vote! May 21st Elections! - Yo! Venice! Home Venice Beach California Go Vote! May 21st Elections! Go Vote! May 21st Elections! Today is voting day here in Los Angeles! The General Municipal and Special Elections will elect a new Mayor amongst other things! Click here to find your polling place! Once you enter your address, a sample ballot will pop up! While Yo! Venice! 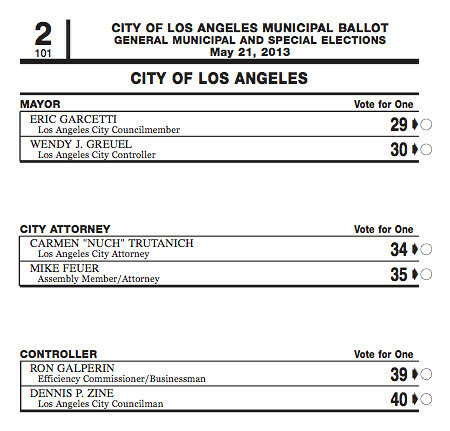 does not usually make political endorsements, we do endorse Eric Garcetti for Mayor. Garcetti, who grew up in Los Angeles, knows the dynamics of Venice well and will likely be the best candidate for our community. In regard to measures D,E and F, which deal with medical marijuana regulation and taxation: It appears that Proposition D is the measure to vote yes on. It is supported by the LA Times and Bill Rosendahl amongst others. The measure would allow about 135 medical marijuana dispensaries to remain open for business. The LA Times notes that “it’s the most readily enforceable of the three cannabis-related measures on the ballot”. The LA Times full list of endorsements can be read by clicking here.